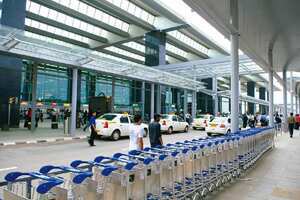 New Delhi: National Aviation Co. of India Ltd (Nacil), which operates Air India, has entered into an agreement with Singapore Airport Terminal Services (SATS), to jointly provide ground and cargo handling services at the Mumbai, New Delhi, Chennai and Kolkata airports, Nacil executive director Jitender Bhargava said on Tuesday. The agreement will require approval from the Union cabinet, which is likely to take it up at its next meeting. Air India is already providing ground handling with SATS at the two new airports commissioned in Bangalore and Hyderabad this year. “We already have tie-ups with them (SATS) at two airports; there are four other airports that are undergoing modernization, so this covers them," Bhargava said. Some analysts said Air India’s proposal to offer ground and cargo handling services at the four airports was an opportunity for the national carrier to make use of its excess staff and increase revenues. “It’s a logical extension for the airline, which will also help their bottom line," Gurinder Pal Singh Arora, senior manager at audit and consulting firm KPMG, said. “The only challenge will be for the third entity...with Air India doing most of its own ground handling and the airport operator doing the rest, how much will be left for the third operator is a big question."